We Mutha Industries Manufacturer ofFloor Safety Signs & Floor Stands in Mumbai, India. Floor Safety Signs & Floor Stands uses to warn visitors and employees of potential hazards on the groundKeep your work environment safe by alerting employees and visitors of present dangers with Floor Signs & Floor Stands. 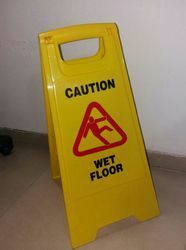 "Caution Wet Floor" Sign Board can be used to warn visitors, employees to avoid mishap or unnecessary injury in case the floor is wet during cleaning or other maintenance works. Two sided floor sign is used in narrow areas. Easy storage and transport on janitor cart.